Only new books purchased at Books, Bytes & Beyond will be autographed at these events. Some of our events are not open to the public, though autographed and personalized books may still be available! Please contact us to purchase a book to be signed for you. Events and signings that are open to the public are noted as such. 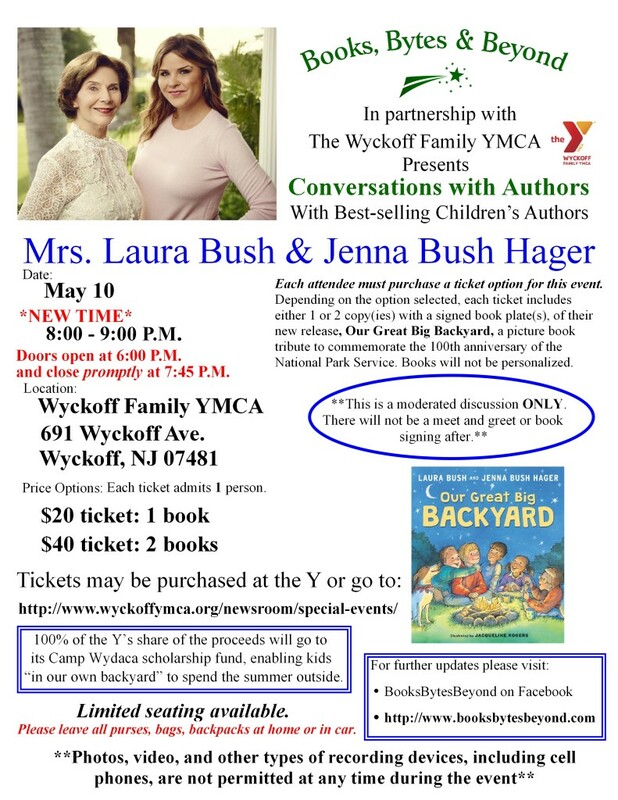 *EVENT TIME CHANGE* Former First Lady Laura Bush and Jenna Bush Hager!!! « Book Launch Event with Anna Kang & Christopher Weyant!!! For decades, former First Lady Laura Bush has championed key issues in the fields of education, health care, human rights, and the preservation of our nation’s heritage. A hiking and outdoors enthusiast, Mrs. Bush encourages Americans to spend time in and care for our national parks. She is also the author of the bestselling memoir Spoken from the Heart. Today, as the chair of the Women’s Initiative at the George W. Bush Institute, Mrs. Bush continues her work on global health-care innovations, empowering women in emerging democracies, education reform, and supporting the men and women who have served in America’s military. Jenna Bush Hager is a contributing correspondent on NBC’s Today show and an editor-at-large for Southern Living magazine. She is also the author of the New York Times bestseller Ana’s Story: A Journey of Hope, which she wrote after traveling to Latin America in 2006 as an intern with UNICEF. Hager remains involved with UNICEF and is currently the chair of its Next Generation initiative, which is dedicated to reducing childhood deaths around the world. She is also coauthor with Laura Bush of the children’s book Read All About It!